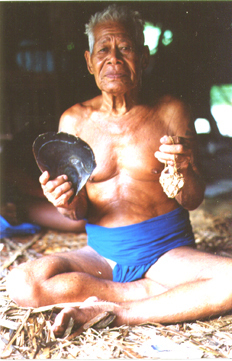 Hipour is pictured here holding the black mother of pearl shell (bwaiyoal) and barnacle container for red turmeric (rokeyok) that he used in the Pwo ceremony which he performed on Polowat in August 1997. Two authors who have written major works on the subject of traditional navigation in Micronesia credit Hipour with providing them with invaluable assistance and information. First, Thomas Gladwin in East is a Big Bird: Navigation and Logic on Puluwat Atoll; and second, David Lewis in We, The Navigators. Through my association with Jesus Urupiy and David Lewis, I had hoped to learn more about the Pwo ceremony which Hipour performed. Happily, I can report that Hipour was very generous in his answers to my many questions and our meeting was made even more special because he spontaneously remembered a chant for the hos weather charm that he used to carry with him on long-distance voyages. (See also photo Navigator Weather Charm).